If you’re still planning out your SXSW schedule, it’s time to pencil in Budweiser’s tribute to country music. 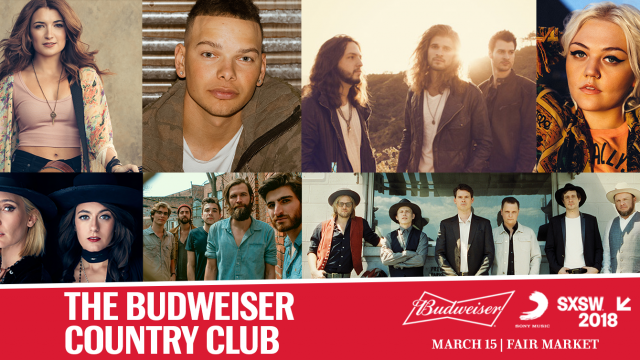 On March 15, Budweiser hosts its first ever country music showcase. Dedicated fans are invited to gather at Austin’s Fair Market to raise a cold one to America’s most iconic music genre – country music. The party doesn’t end after the performances. Dee Jay Silver will perform in between sets, and will host a late night show. There will also be photo opportunities, custom giveaways, games, food and ice cold Budweiser. This event is 21+, and is open to the public. Valid photo ID is required for entry. View the official music lineup and RSVP here. When you want to unwind after a day at SXSW, visit the Budweiser Country Club. This Bud’s for you. I love mountains, the Purdie Shuffle, and a good road trip.